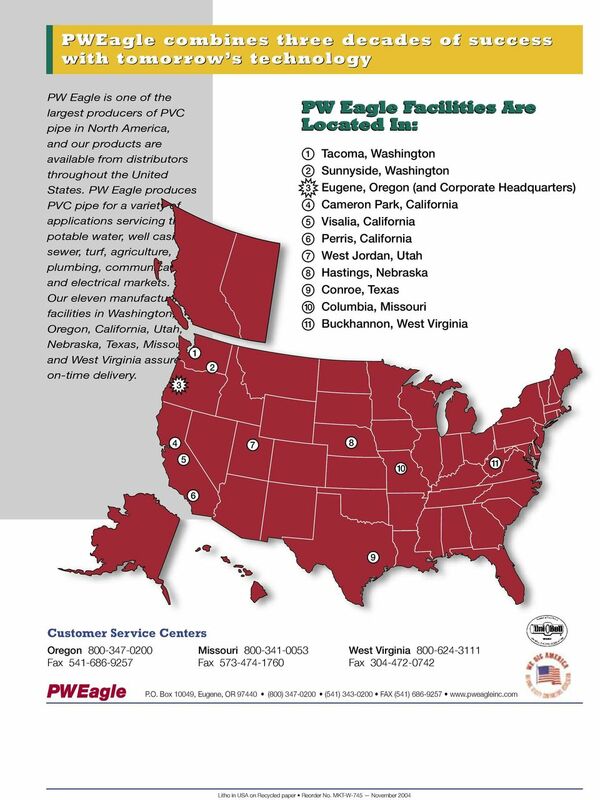 Download "Ultra-Rib PVC Storm Sewer Pipe 8" - 30""
2 PW Eagle s Ultra-Rib is an open profile PVC gravity-flow storm sewer pipe with gasketed joints. The concentric reinforcing ribs optimize the pipe s structural capability. During installation, Ultra-Rib is an easily handled flexible conduit which works with the surrounding soil to limit deflection. Ultra-Rib is available in sizes 8", 10", 12", 15", 18", 21", 24", 27" and 30". It is an extruded, seamless pipe, made from PVC compounds meeting ASTM D1784. Proven in worldwide applications, Ultra-Rib is the optimized profile design, offering strength with economy and excellent flow characteristics. EASY TO IDENTIFY EASY TO HANDLE EASY TO ASSEMBLE EASY TO INSTALL EASY TO FIELD CUT EASY TO TAP EASY TO ADAPT EASY TO MOVE GASKET IF DESIRED EASY TO SIZE DOWN OR IMPROVE FLOW IN LINES EASY TO FIND THE RIGHT SIZE FOR YOUR PROJECT EASY TO TEST EASY TO SPECIFY WITH CONFIDENCE The Product Standards Ultra-Rib meets or exceeds all requirements of the following standards: AASHTO M304M Polyvinyl Chloride (PVC) Profile Wall Drain Pipe & Fittings Based on Controlled Inside Diameter ASTM F794 Standard Specification for Polyvinyl Chloride (PVC) Ribbed Gravity Sewer Pipe and Fittings Based on Controlled Inside Diameter Uni-Bell UNI-B-9 (for 4"-15") Recommended Standard Performance Specification for Polyvinyl Chloride (PVC) Large Diameter Gravity Sewer Pipe and Fittings Based on Controlled Inside Diameter Thermal Effects Temperature changes have a negligible effect on Ultra-Rib and can be ignored as thermal expansion and contraction are easily compensated for at the gasketed joints. A good rule of thumb in designing PVC piping systems is to allow 3/8" of length variation for every 100 feet of pipe, for each 10 F change in temperature (2.7mm/10m/5 C). Hydraulics The smooth interior wall of Ultra-Rib provides excellent flow characteristics and resists the build-up of solids. The long length of Ultra-Rib pipe (13- or 20-foot laying length) and the reduced number of joints yield a Manning flow coefficient of n =.009 under full flow conditions. Chemical & Abrasion Resistance The chemical resistance of PVC pipe is legendary. Acids, alkalines, and normally diluted hydrocarbons have no effect on the pipe or its gaskets. Aggressive soil conditions due to sulphates, carbonates or sea water are easily tolerated by Ultra-Rib, as as well as road run-off and most industrial effluents. PVC pipe has been subjected to abrasion tests by several independent laboratories. These tests prove that PVC pipe will resist abrasion better than concrete and steel pipe. 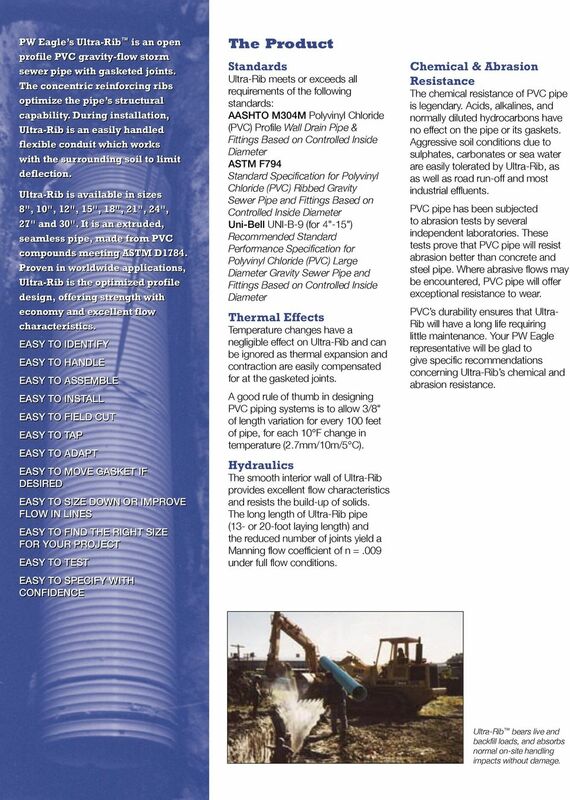 Where abrasive flows may be encountered, PVC pipe will offer exceptional resistance to wear. PVC s durability ensures that Ultra- Rib will have a long life requiring little maintenance. Your PW Eagle representative will be glad to give specific recommendations concerning Ultra-Rib s chemical and abrasion resistance. Ultra-Rib bears live and backfill loads, and absorbs normal on-site handling impacts without damage. 3 Assembly Effective joining of pipe to pipe and fittings is assured with Ultra-Rib. A water-tight seal is assured because a properly installed gasket fits securely into the matching profile of the pipe wall and cannot be displaced during joining. Fittings In-Line Fittings A complete line of fittings is available with Ultra-Rib sealing dimensions - no adapters are required. If the customer chooses to use the standard in-line fittings used with ASTM D3034 SDR35 PVC Sewer Pipe, adapters to Ultra-Rib are available. Cutting Ultra-Rib can be cut conveniently to a desired length, without special tools, by sawing between any two ribs. Because the ribs are concentric, there are no spiral ribs or seams to cut through. Accurate cuts can be made midway between any two ribs because the ribs are perpendicular to the axis of the pipe and provide a guide for straight cutting. The spigot does not require chamfering, but any ragged cuttings from the inside cut edge should be trimmed. Lubricating The bell has a smooth interior, which will easily accept the gasketed spigot when properly lubricated. Simply apply a coat of PVC pipe lubricant evenly around the entry portion of the bell to approximately half of its length. 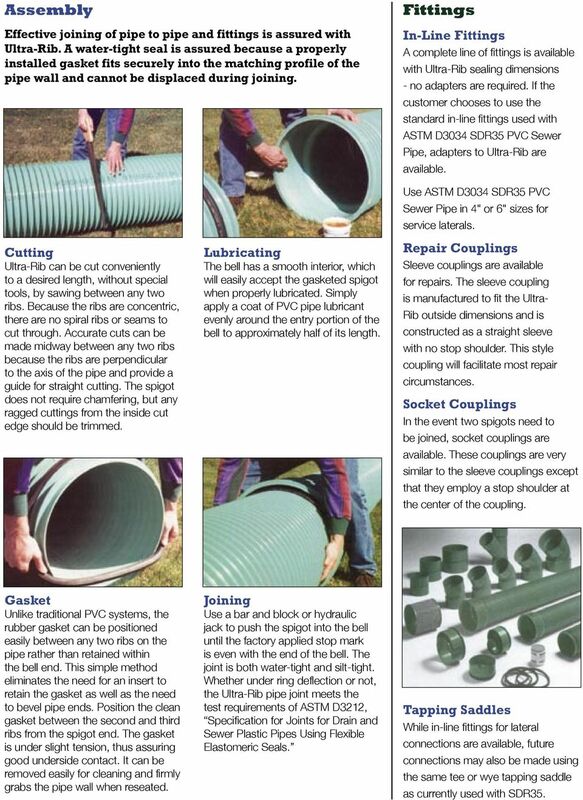 Use ASTM D3034 SDR35 PVC Sewer Pipe in 4" or 6" sizes for service laterals. Repair Couplings Sleeve couplings are available for repairs. The sleeve coupling is manufactured to fit the Ultra- Rib outside dimensions and is constructed as a straight sleeve with no stop shoulder. This style coupling will facilitate most repair circumstances. Socket Couplings In the event two spigots need to be joined, socket couplings are available. These couplings are very similar to the sleeve couplings except that they employ a stop shoulder at the center of the coupling. Gasket Unlike traditional PVC systems, the rubber gasket can be positioned easily between any two ribs on the pipe rather than retained within the bell end. This simple method eliminates the need for an insert to retain the gasket as well as the need to bevel pipe ends. Position the clean gasket between the second and third ribs from the spigot end. The gasket is under slight tension, thus assuring good underside contact. It can be removed easily for cleaning and firmly grabs the pipe wall when reseated. Joining Use a bar and block or hydraulic jack to push the spigot into the bell until the factory applied stop mark is even with the end of the bell. The joint is both water-tight and silt-tight. Whether under ring deflection or not, the Ultra-Rib pipe joint meets the test requirements of ASTM D3212, Specification for Joints for Drain and Sewer Plastic Pipes Using Flexible Elastomeric Seals. Tapping Saddles While in-line fittings for lateral connections are available, future connections may also be made using the same tee or wye tapping saddle as currently used with SDR35. 4 Handling & Performance Handling & Cutting Ultra-Rib pipe and fittings give contractors the ultimate in handling convenience and installed performance. Rugged Ultra-Rib has the highest stiffness-to-weight ratio of our PVC pipe, size by size. In fact, one man can easily handle 13' lengths up to 15" size; two men can handle 18"-30". This makes handling and installation considerably easier, often cutting overall job costs by up to one-third. Ultra-Rib combines strength and ease of handling because of its design. Solid ribs run radially around Ultra-Rib pipe to give the most effective use of reinforcement. Not only do the ribs bear live and backfill loads, they help absorb normal on-site handling impacts without damage. The ribs of Ultra-Rib pipe are perpendicular to the axis of the pipe and assist workers in making perfect right-angle cuts because there are no spiral shapes or seams to confuse the eye. The cut edge can be left square without chamfering. Once cut, there is no need to rout a ring groove or seal the cut ends, which must be done with spiral-wound profile pipe. At the job site, units of pipe should be kept in their factory bundles until pipe is strung. Bundles of pipe should not be stacked more than two high on level ground. Joint Performance An infiltration rate of less than 50 U.S. gal./inch dia./mile/day can be assured using the Ultra-Rib patented joint design. 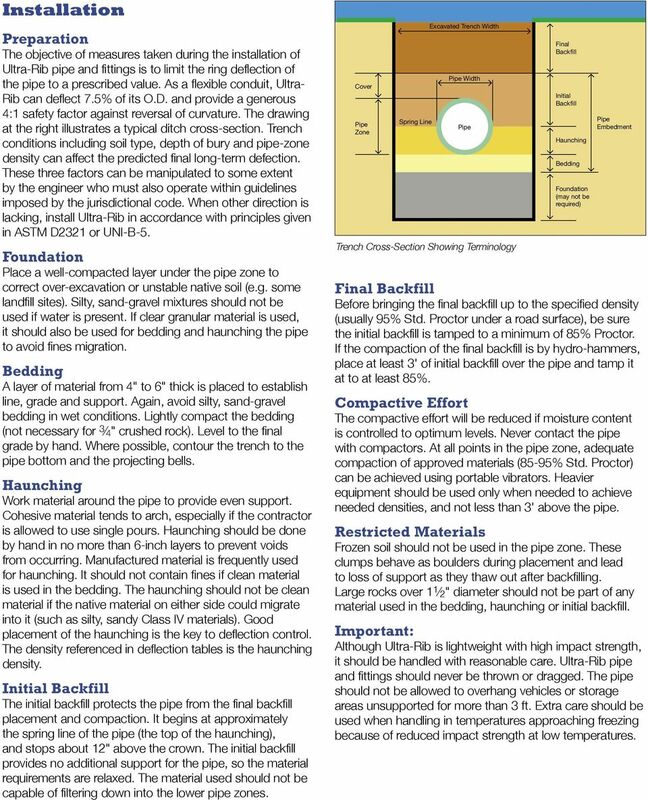 Catch-basin cave-ins are eliminated because the Ultra-Rib joint will not permit infiltration of fine bedding materials, thus eliminating the need for filter fabric wrap at the joints. The gasketed Manhole Adaptor supplied with Ultra-Rib is equally tight. Rib and gasket profiles for illustrative purposes. Actual product may vary. Dimensions Ultra-Rib Dimensions Nominal Minimum Approximate Approximate Minimum Pipe Size Inside Diameter Outside Diameter Bell O.D. Waterway Wall (inches) (inches) (inches) (inches) (inches)* * Note: Minimum Waterway Walls for 8-, 10-, and 12-inch sizes exceed ASTM F794 standards. 5 Installation Preparation The objective of measures taken during the installation of Ultra-Rib pipe and fittings is to limit the ring deflection of the pipe to a prescribed value. 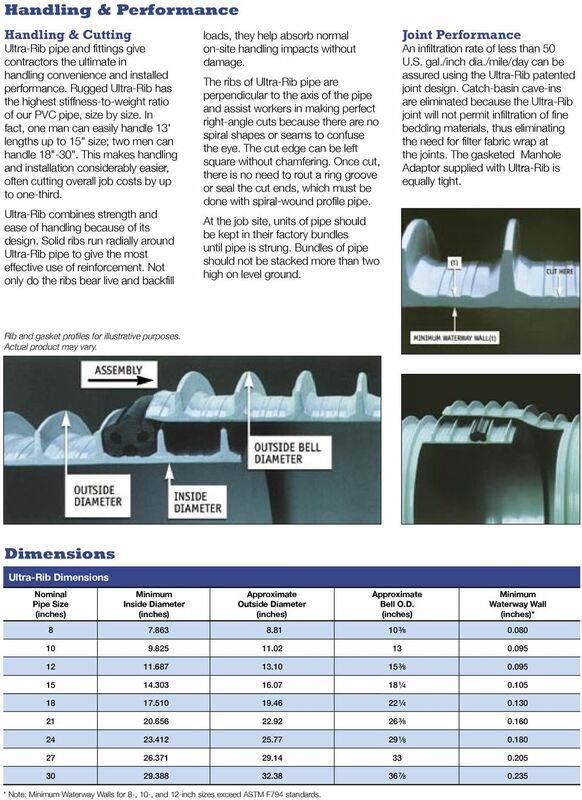 As a flexible conduit, Ultra- Rib can deflect 7.5% of its O.D. and provide a generous 4:1 safety factor against reversal of curvature. The drawing at the right illustrates a typical ditch cross-section. Trench conditions including soil type, depth of bury and pipe-zone density can affect the predicted final long-term defection. These three factors can be manipulated to some extent by the engineer who must also operate within guidelines imposed by the jurisdictional code. When other direction is lacking, install Ultra-Rib in accordance with principles given in ASTM D2321 or UNI-B-5. Foundation Place a well-compacted layer under the pipe zone to correct over-excavation or unstable native soil (e.g. some landfill sites). Silty, sand-gravel mixtures should not be used if water is present. If clear granular material is used, it should also be used for bedding and haunching the pipe to avoid fines migration. Bedding A layer of material from 4" to 6" thick is placed to establish line, grade and support. Again, avoid silty, sand-gravel bedding in wet conditions. Lightly compact the bedding (not necessary for 3 4 " crushed rock). Level to the final grade by hand. Where possible, contour the trench to the pipe bottom and the projecting bells. Haunching Work material around the pipe to provide even support. Cohesive material tends to arch, especially if the contractor is allowed to use single pours. Haunching should be done by hand in no more than 6-inch layers to prevent voids from occurring. Manufactured material is frequently used for haunching. It should not contain fines if clean material is used in the bedding. The haunching should not be clean material if the native material on either side could migrate into it (such as silty, sandy Class IV materials). Good placement of the haunching is the key to deflection control. The density referenced in deflection tables is the haunching density. Initial Backfill The initial backfill protects the pipe from the final backfill placement and compaction. It begins at approximately the spring line of the pipe (the top of the haunching), and stops about 12" above the crown. The initial backfill provides no additional support for the pipe, so the material requirements are relaxed. The material used should not be capable of filtering down into the lower pipe zones. Cover Pipe Zone Spring Line Excavated Trench Width Pipe Width Pipe Trench Cross-Section Showing Terminology Final Backfill Initial Backfill Haunching Bedding Foundation (may not be required) Pipe Embedment Final Backfill Before bringing the final backfill up to the specified density (usually 95% Std. Proctor under a road surface), be sure the initial backfill is tamped to a minimum of 85% Proctor. If the compaction of the final backfill is by hydro-hammers, place at least 3' of initial backfill over the pipe and tamp it at to at least 85%. Compactive Effort The compactive effort will be reduced if moisture content is controlled to optimum levels. Never contact the pipe with compactors. 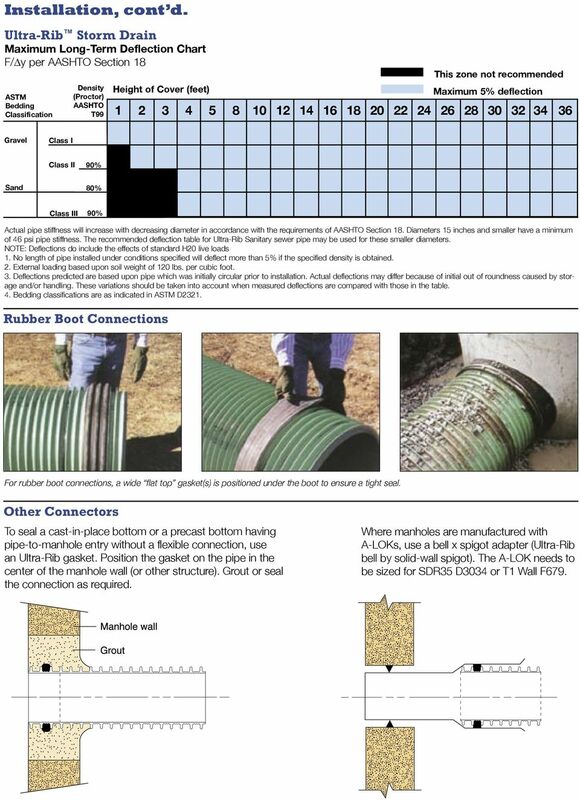 At all points in the pipe zone, adequate compaction of approved materials (85-95% Std. Proctor) can be achieved using portable vibrators. Heavier equipment should be used only when needed to achieve needed densities, and not less than 3' above the pipe. Restricted Materials Frozen soil should not be used in the pipe zone. These clumps behave as boulders during placement and lead to loss of support as they thaw out after backfilling. Large rocks over " diameter should not be part of any material used in the bedding, haunching or initial backfill. Important: Although Ultra-Rib is lightweight with high impact strength, it should be handled with reasonable care. Ultra-Rib pipe and fittings should never be thrown or dragged. The pipe should not be allowed to overhang vehicles or storage areas unsupported for more than 3 ft. Extra care should be used when handling in temperatures approaching freezing because of reduced impact strength at low temperatures. 6 Installation, cont d. Ultra-Rib Storm Drain Maximum Long-Term Deflection Chart F/ y per AASHTO Section 18 ASTM Bedding Classification Density (Proctor) AASHTO T99 Height of Cover (feet) This zone not recommended Maximum 5% deflection Gravel Class I Class II 90% Sand 80% Class III 90% Actual pipe stiffness will increase with decreasing diameter in accordance with the requirements of AASHTO Section 18. Diameters 15 inches and smaller have a minimum of 46 psi pipe stiffness. 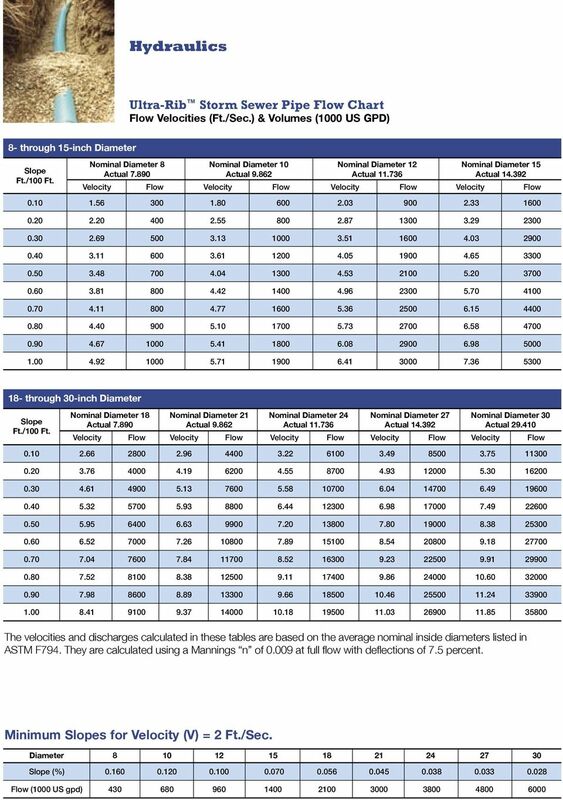 The recommended deflection table for Ultra-Rib Sanitary sewer pipe may be used for these smaller diameters. NOTE: Deflections do include the effects of standard H20 live loads 1. 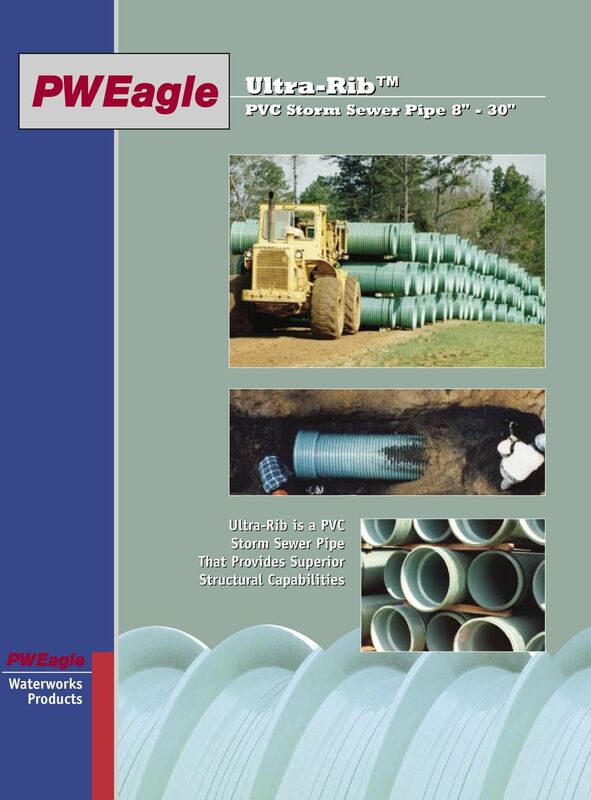 No length of pipe installed under conditions specified will deflect more than 5% if the specified density is obtained. 2. External loading based upon soil weight of 120 lbs. per cubic foot. 3. Deflections predicted are based upon pipe which was initially circular prior to installation. Actual deflections may differ because of initial out of roundness caused by storage and/or handling. These variations should be taken into account when measured deflections are compared with those in the table. 4. Bedding classifications are as indicated in ASTM D2321. Rubber Boot Connections For rubber boot connections, a wide flat top gasket(s) is positioned under the boot to ensure a tight seal. Other Connectors To seal a cast-in-place bottom or a precast bottom having pipe-to-manhole entry without a flexible connection, use an Ultra-Rib gasket. Position the gasket on the pipe in the center of the manhole wall (or other structure). Grout or seal the connection as required. Where manholes are manufactured with A-LOKs, use a bell x spigot adapter (Ultra-Rib bell by solid-wall spigot). The A-LOK needs to be sized for SDR35 D3034 or T1 Wall F679. Gasketed Sewer Pipe. Storm and Sanitary pipe for use with STI Gasketed Sewer Fittings.